When is fiber application performed? If material loss of the tooth which had root canal treatment is not too much, fillings are applied but if material loss is too much, inlay and onlay treatments which prevent tooth from cracks are necessary. 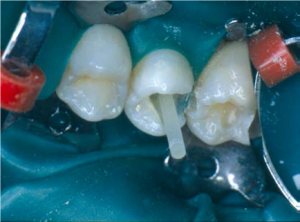 If no crown is left on the tooth but the root is healthy, applying a veneer on a ‘post’ which is done getting support from the root is necessary. What are the types of fiber application? Fiber posts are the types of posts which are used for fiber application. Why are fiber posts preferred? They are attached to teeth both mechanically and chemically. Because there are no metal reflections under full ceramic restorations, an esthetic look is achieved. How is fiber post applied? It is applied by using special drills and adhesives.